SEALDs RYUKYU member Jinshiro Motoyama, calling for “no new US base”, in front of Camp Schwab’s gate at Henoko, Nago at 2 p.m. on November 14. On November 14, in front of the Camp Schwab gate at Henoko, Nago, about 200 young people, including students of the youth group SEALDs RYUKYU, gathered to protest against construction of a new U.S. base in Henoko and Oura Bay. 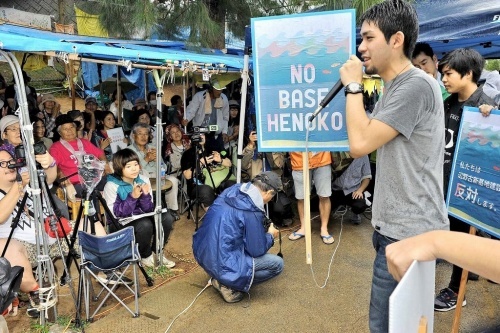 The protesters criticized the Japanese government for continuing with the building of the new base in Henoko. The participants made their voices heard and also sang songs in protest against the construction. The event was held as part of a nationwide campaign against the planned new base. Members of SEALDs also held protests in Tokyo and Nagoya on the same day. Young people have been leading recent action against the Henoko base throughout Japan.